We welcome visitors and legal researchers to the Gallagher Law Library. This guide will help you understand our policies and resources. The Gallagher Law Library is open to the public and you are welcome to visit us in person to use our legal resources and materials. If you need help identifying and finding legal resources, you can speak to a Research Services librarian in the Reference Office, located on floor L1 (the first lower level) of William H. Gates Hall. We are open Monday through Friday, closed on the weekends. You can find our hours here. 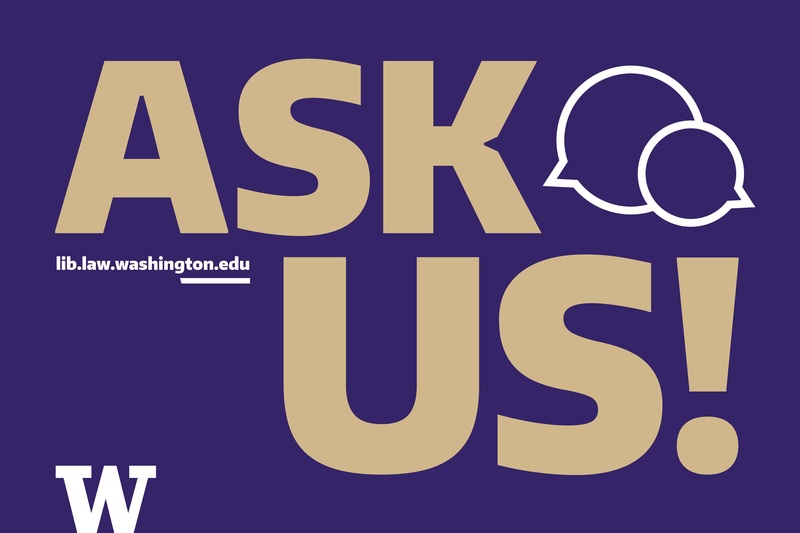 You may also reach us by phone at (206) 543-6794 or by email via our Ask Us! service. Please allow a 24-48 hour turnaround time for questions asked via this service. The Research Services librarians provide legal research assistance; that is, we can direct you to resources that you can use to find answers to your legal research questions. We cannot tell you what law applies to your situation or give you legal advice. For similar reasons, it is our policy not to read legal materials over the phone or email the text of legal resources via our Ask Us! service. If you cannot come into the law library, you might want to use our fee-based Copy & Send Service. Many Federal and Washington State laws, cases, and regulations are available for free online, as described in Researching a Legal Issue. Note that the law on many subjects (family law, inheritance and wills, real estate, etc. varies from state to state. We cannot answer questions dealing with states other than Washington or countries other than the United States. Visit lawhelp.org for links to free or low-cost providers and information for U.S. states other than Washington. Could you find and explain this case to me? Anyone can register as a law library borrower. For more information, see the state regulations governing the use of the Law Library (WAC 478-168-010 to -096). To register, bring in recent photo ID and proof of current address. Registration will allow you to check out books and use legal research computers and our wireless internet. Registrations are good for one year. Once your registration expires, you must come back in person to renew it. Bring your item to the Circulation Desk to check it out. The Circulation Desk closes 15 minutes before the Library closes. Loan periods vary depending on the status of the borrower and the type of materials checked out. To renew your item, sign into your Library Account. You can also call the Circulation Desk (206.543.4086) during business hours to renew over the phone. Note: if your item is overdue or if your patron account has expired (1 year from the date of registration), you must renew in person. Your item may be recalled because it is requested by another borrower. You will receive an email notification with a shortened (typically two weeks) loan period. Fines & fees accrue when items are late, lost, or damaged. The UW Libraries Fines page has a full explanation of how fines are assessed and how to pay them. Law Library books can be returned to any UW Libraries book returns on any of our three campuses (Seattle, Bothell, Tacoma). Do not return UW Libraries books to any other library (e.g., King County Library System, Seattle Public Library, etc.). Returning a UW Libraries book to a non-UW Library could result in late fines or a bill for replacement.